We are very pleased to have one of the finest turf fields in the country available to us as we start the School’s 230th year. It seems not too long ago that I played on Jakeman Field as a young Grade 10 KES student and was excited to be playing on the senior team. At that time, Jakeman Field was the most spectacular field at our School, the scenery to the south was phenomenal and Henri Medina ( 1975-2011) was our Senior Boys’ head coach. Time moves forward, now Henri and his wife Deb (1977-2010) are retired and their daughter Alyssa (1998-2006) is on faculty. I have been coaching soccer here for over two decades but was never more excited than when I stepped onto our new pitch, as it was completed just over a week ago. I am envious of our young players having this opportunity, but pleased that I get to enjoy it and have another thing to tease Darcy (1975-77; staff 1980-2016) about! Since my time as a student and faculty member, we have added our much needed and beautiful Ted Canavan Athletic Centre to the landscape and lost some of the view of Martock. With the addition of the new turf field, the sheer size alone has expanded the field deep into the wooded area to the east, gaining back a significant amount of the southern view. All is great at our School. I can’t wait to coach under the lights, when they are added, and I look forward to the faculty getting some recreational soccer in somewhere in an always frenetic schedule. Our Senior Boys D1 soccer team was fortunate to play their very first competitive match on the new pitch. The match was a win against our cross-town rival – Avon View, in our first league game of the year. Our Junior Varsity team, coached by new staff member and lifer alumnus Christian Lakes (2007-2013; Mr. Kevin Lakes’ son), will play a match today on the new turf. Our Junior teams have already booked dates for their first matches and our Senior Girls have three home matches booked. This field will help us to provide state-of-the-art facilities to aid in the development of our student-athletes and provide for some great memories. Our first tournament will be hosted this weekend by our D1 Senior boys. We will also utilize Herman and Jakeman fields. We will play host to Halifax West, Parkview, Sir John A, Horton, Yarmouth, Hants East and Cobequid Education Center. Three of these teams were in the final four of the D1 Provincial Championships last year, including our KES Senior boys. It should be a good one! Please check out the website for tournament details as well as other KES varsity team matches on our new “place to be” at KES. 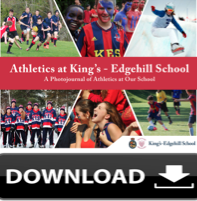 Athletics is one of the four pillars of a King's-Edgehill School education, which is why we offer three seasons of various sports and athletic programmes. Download our Athletics PhotoJournal to discover which of the over 20 different sports your child will love.